Working with the finest European mills, King & Bay offers a selection of Shatnez-Free fabrics for your Bespoke suits. A commandment, or mitzvah, of the Jewish faith prohibits the wearing of garments that contain any combination of both lamb’s wool and linen. A practical difficulty arises for those striving to comply, in that, even a garment listed as 100% wool, can legally contain fibres of linen. And it is not uncommon to use linen as a lining underneath the collar (for example) of an otherwise 100% wool suit. A Shatnez-Free suit is one that is certified to contain no combination of wool and linen. 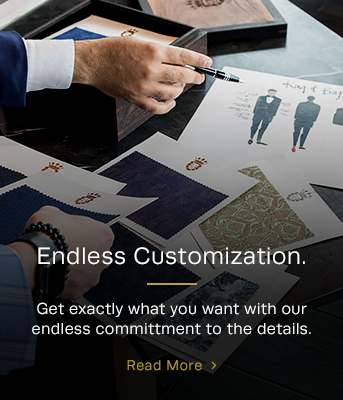 By working with the finest European mills, our King & Bay master tailors have accessed a selection of fabrics of the highest quality and purity allowing us to offer truly Shatnez-Free custom garments to our clientele. Compliance & quality you can trust. Whether for Shul, a Bar Mitzvah, a Wedding or simply for daily use, you’ll find a Shatnez-Free suit from King & Bay will allow you to dress in style and confidence for any occasion. You'll look great and feel at ease knowing that the fabric you are wearing is not only of excellent quality, but is compliant, as well. We'll look after the details.